TODAY Style gathered four pairs of mothers and daughters to talk about their journey to embracing their hair just as it is. 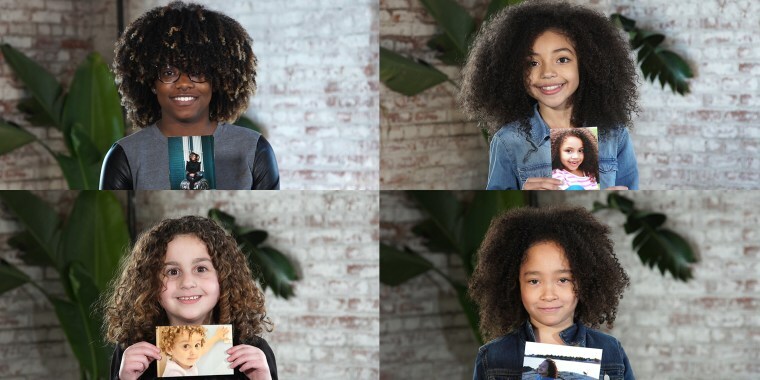 These curly-haired girls love their natural texture ... and some are even teaching their moms a thing or two about self-confidence. The journey to embracing your hair and its natural texture isn't always easy. Women with straight hair often find themselves wishing for curly hair and vice versa. But more often than not, it's the girls with curls who face the biggest struggle in accepting their texture. TODAY Style gathered four pairs of mothers and daughters to sit down and talk about their journey to embracing (and loving!) their hair just as it is. Julz Cepeda didn't wear her hair curly until she became a mother to her daughter, Mimi. Cepeda who had a mother with stick-straight red hair, recalls going to the salon every week to have her hair professionally styled straight. "If I had an interview, if I had an important event in school, if I had a party, a wedding, anything that I deemed important, I would go and blow dry my hair straight so that it could fit the mold or fit what was supposed to look right," Cepeda said. She remembered having family members say to her, "'Oh my god, that's how you're going to go out? That's not professional. That's not this, that's not that.'" Nearly since Mimi, 18, was born, they would get their hair blow-dried straight together, until Cepeda decided one day that enough was enough, and the duo started wearing their natural curls. They haven't looked back since. It hasn't always been easy. Mimi explained that a teacher once told her to tame her hair for a debate at school. The same thing happened when a classmate asked how she was going to wear her hair to prom. She said curly and the classmate asked why she wouldn't wear it straight. But this mother-and-daughter duo love their curls no matter what anyone says. So much so, they decided to start a blog in hopes of inspiring other women to embrace their own spirals. "Now, I'm on top of my curls. I'm good. I don't care anymore. I got this," Mimi said. "I love my curly hair because it makes me feel true to myself. And more confident. And stronger." Lydia Delgado struggled for years to accept her curls. "When I was younger, I didn't really love my hair because, as you know, when I grew up in Puerto Rico my hair wasn't very accepted, so the kids would make fun," Delgado said to her daughter. "It made me feel sad. It made me feel uncomfortable." Delgado was bullied for her curls as a child and recalls people saying her hair looked like a Brillo pad. Her mother didn't know how to style curls and so she was never able to fully embrace them. Delgado decided to wear her straight as a result, but that all changed when her daughter, Miranda Rivera, was in kindergarten and decided she wanted straight hair like her mom's. Delgado used to take her to a hairstylist who relaxed her hair. She recalls the stylist even burning her daughter's scalp at times in order to straighten and tame her curls. "I felt like it wasn't fair that we kept going to a person who constantly kept reminding us or telling us how to straighten our hair as opposed to loving what we already have; how to make it different, as opposed to loving it the way we loved it." said Delgado. So, this mom decided it was time to go curly ... for both of them. "I used to want straight (hair), but then (my mom) started wearing curly and I started to like her hair curly, and I realized I had the same hair as her. So we could wear the same hair, and I actually started to like it that way," the 10-year-old explained. Delgado and Rivera now go to hairstylist Mona Baltazar, who helped them realize that their curls are beautiful just they way are. They haven't gone back to straight hair since. "I don't want to look like everybody else, because then I'd just be like a whole bunch of the same people and I wouldn't really like that," Rivera said. "Without my curls, I don't know what I would do because I've gotten used to it and I just love them so much." "I think they're a part of me. They make me who I am," she continued. "And without them we wouldn't be who we are. It's part of us," added Delgado. Lisa and Sadie Markowitz both love their matching curls now, but that wasn't always the case. She recalled looking at the other girls in school and wishing she had straight hair, too. But at that time, many of the girls with straight hair were getting their hair permed. “All of the kids in class had straight hair or they had permed hair. And nobody looked like me at all. So people used to tease me and the boys used to tease me, and they would call me Afro Puff,” she said. In high school, a classmate encouraged Lisa to start wearing her hair naturally, which prompted her to learn how to style curls for the first time. Both mother and daughter love that they look so alike. “When we all walk down the road together, wow, that’s a lot of hair coming at ya,” Markowitz said. Although Margaret O'Malley doesn’t have curly hair herself, she has mastered the art of styling her daughter’s hair. But she didn't always feel as confident. There are still a few challenges when it comes to taming George's curls, like when her helmet kept popping off while skiing, but, according to her mom, George is so confident that she doesn’t even bat an eyelash when things like that happen. Like when a classmate told George she could never be a ballerina because she had curly hair, she was quick to set the record straight. “I know a ballerina who I met, and her name's Misty Copeland, and she has curly hair,” she remembered saying. Her mom agrees. “If you just accept who you are, and believe that you're beautiful. It's so much better than second-guessing yourself all the time,” said O'Malley.